In the framework of its UPR Platform and upon request of its members and partners, CCIG continues its efforts to foster training activities aimed at enhancing NGO participation in the Universal Periodic Review (UPR). The last training session focusing on UPR Lobbying Activities took place on May 4 with the participation of Geneva-based and local NGO representatives. The speaker, Jean-Claude Vignoli (Programs Director at UPR-info ) shared his in-depth knowledge on the functioning of this UN mechanism as well as the results of a first assessment of its effectiveness: a survey run by UPR info on 11’000 recommendations issued in the first UPR cycle shows that 48% of these recommendations are either fully or partially implemented. He also brought concrete examples of UPR recommendations that were successfully implemented by highlighting positive legal and policy changes that occurred in the concerned countries. 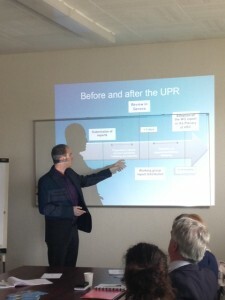 ‘Effectiveness’ is indeed the key word to keep in mind while building up NGO strategy within the UPR process. As for all UN mechanisms for the promotion and protection of human rights, NGO information on violations occurring at the local level is greatly needed in order to make the review process credible and effective. However, the intergovernmental nature of this mechanism –the UPR is a State-driven process-does not allow NGOs to directly take the floor during the UPR sessions. Therefore, specific lobbying efforts are required from NGOs in order to ensure that concerns raised on the ground are duly taken into account in the international arena. As highlighted by Mr. Vignoli, lobbying activities are to be carried out in Geneva, but also at the local level in order to ensure those main human rights issues are ‘secured’ in UPR recommendations, which will be potentially accepted –and therefore implemented- by the State under review. The speaker also shared practical hints on strategic options and timing as well as available tools for lobbying. Finally, it was highlighted how the cooperation between NGOs and the State under review for the implementation of UPR recommendations is of pivotal importance in order to truly improve effectiveness of human rights’ protection at the national level. No Comments to "CCIG Training Session on UPR Lobbying"